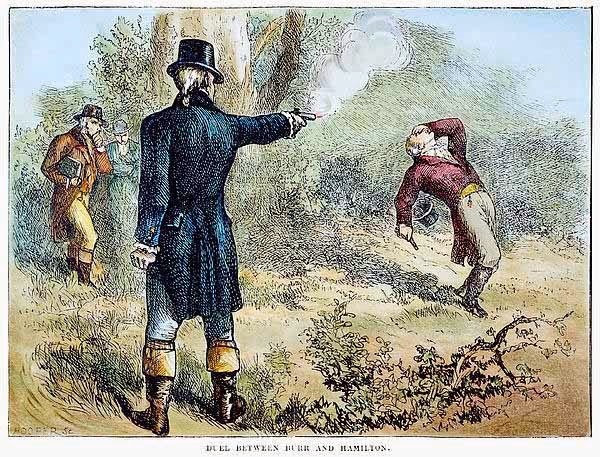 1804 - On July 11, Alexander Hamilton is mortally wounded in duel with Aaron Burr at Weehawken, dies in New York City on following day. ​1806 - Colonel John Stevens, a Revolutionary War veteran who also served as state treasurer during the War, builds the steamboat Phoenix, which in 1809 sailed from Hoboken to Philadelphia, thus becoming the first steamship to successfully navigate the open ocean. 1807 - Assembly passes a law limiting suffrage to free white males, ending right of women to vote recognized in prior legislation enacted in 1797. The 1807 law was intended to clarify the 1776 Constitution’s guarantee of the franchise to “all inhabitants” to specify that the phrase was not intended to allow slaves and aliens to vote. 1811 - Colonel John Stevens begins operation of steam ferry service between Hoboken and Manhattan, the first such service in the world. 1812 - At the start of the War of 1812, Joseph Bloomfield, who had served as governor since 1801 (with the exception of a single year) and was a major in the Continental Army during the Revolutionary War, resigns as governor to accept a commission as a brigadier general of the US Army and spends most of the War commanding forces on the Canadian border. New Jersey supplies just over 6,000 men to serve in US military. 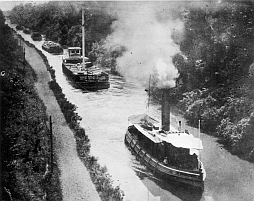 1824 - United States Supreme Court issues decision in the case of Gibbons v. Ogden holding that a New York law granting an exclusive license to a steamboat company established by Robert Fulton and Robert Livingston to navigate New York waters violated the Commerce Clause of the US Constitution giving Congress the right to regulate interstate commerce. 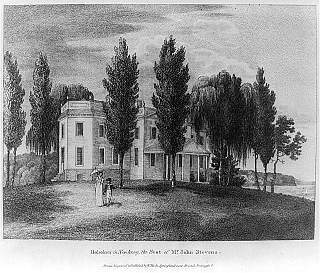 The case was initiated when former New Jersey Governor Aaron Ogden sought to operate a competing steamboat from Elizabethtown to New York City licensed under a charter issued pursuant to a federal statute enacted in 1793. 1825 - Queen's College is renamed Rutgers College after Colonel Henry Rutgers, a veteran of the Revolutionary War and New York legislator and philanthropist, who donated $5,000 and a bell to the college. 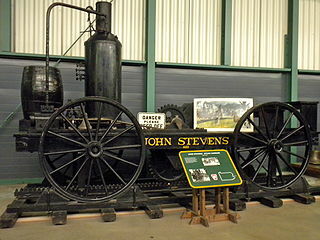 - At his estate in Hoboken, Colonel John Stevens demonstrates operation of a steam railroad locomotive he designed and built capable of hauling several passenger cars. 1830 - On same day of February 4, the legislature grants separate charters to the Camden and Amboy Railroad and Transportation Company to construct a railroad between Camden and South Amboy and the Delaware and Raritan Canal Company. to construct a canal between the Delaware and Raritan Rivers. - On September 9, Charles F. Durant becomes the first native-born American to fly, taking off in a hydrogen-filled balloon from Battery Park in Manhattan before a crowd estimated at 20,000 and landing some three hours later 25 miles away in a farmer's field in Perth Amboy. 1831 - In February, legislation is enacted approving the partial merger of the Camden and Amboy Railroad and Delaware and Raritan Canal companies into an entity known as the Joint Companies, with the state subsequently giving the Joint Companies the power to prevent the construction of any other rail line between New York and Philadelphia. In return for the monopoly in the corridor, the state receives shares of stock and revenue from transit duties on each passenger and ton of freight, which eventually provided as much as a fifth of the state government's total revenues. 1832 - On March 7, the New Jersey Rail Road and Transportation Company is chartered as a parallel line to the Camden & Amboy beginning at Jersey City, but prohibited from building south to New Brunswick due to the C&A's influence in the legislature. 1834 - The Delaware and Raritan canal system is completed at an estimated cost of $2.8 million, with its construction by a workforce largely comprised of recent Irish immigrants. Its traffic was primarily comprised of barges shipping coal from Pennsylvania to cities in New Jersey and to New York City, but after peaking in the 1860s would gradually decline in use in competition with the railroads. 1844 - New Jersey adopts second state constitution, which makes governor popularly elected, extends term from one to three years, gives weak veto power over legislation and limited authority to make appointments. - In the gubernatorial election--the first in which the governor is elected by state voters rather than by the legislature--the Whig Party candidate Charles Stratton is elected in a campaign opposing the extension of the Camden and Amboy Railroad, defeating Democrat John Thomson. Thomson is a former executive and stockholder in the Camden and Amboy controlled by the family of his wife, who is a daughter of Richard Stockton, the signer of the Declaration of Independence and his wife, poet Annis Boudinot Stockton.